The card art is awesome, striking the perfect balance between the surreal and real. 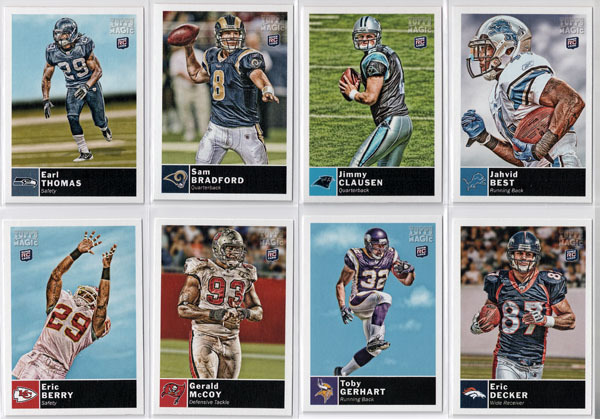 The mini cards might be the best the football card world has ever seen. 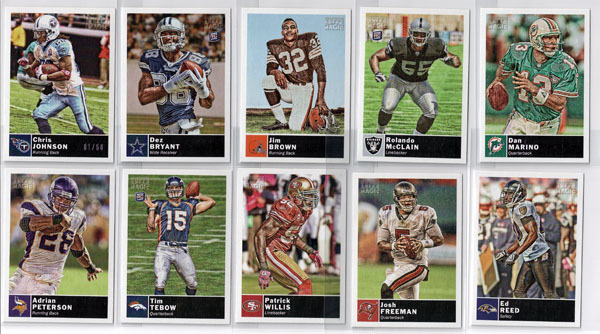 The product's card design as a whole has taken a big step forward over 2009's, which was my favorite football card product last year. The only real area the card design took a step backwards is when it comes to the autographs, last year the sticker drops were more subtle. Another thing I really liked about both last year's and this year's Magic card design is that it fits the game of football unlike other retro products like last year's Topps Mayo, which felt like a baseball card product with guest appearances by football players (both Mayo and Magic are vintage remakes). In my opinion, every trading card product should short print a handful of base cards. The reason for this is that when a product short prints base cards, it immediately makes a product deeper and creates added value outside of the hits. Far too many products these days give you 2-4 hits and stack of absolutely worthless and un-collectible base cards. 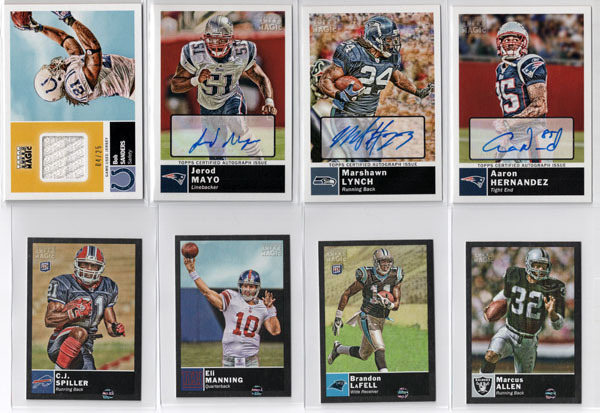 One of the coolest parts about the checklist is that that every player in the base set is represented in the autograph, relic, mini, black mini, pigskin mini and chrome auto sets. This makes for a clean, collectible and easy to understand checklist that presents numerous levels of set completion for set builders. Another major plus about 2010 Topps Magic's checklist is that it strikes the perfect balance between retired legends, current stars and rookies. From Y.A. 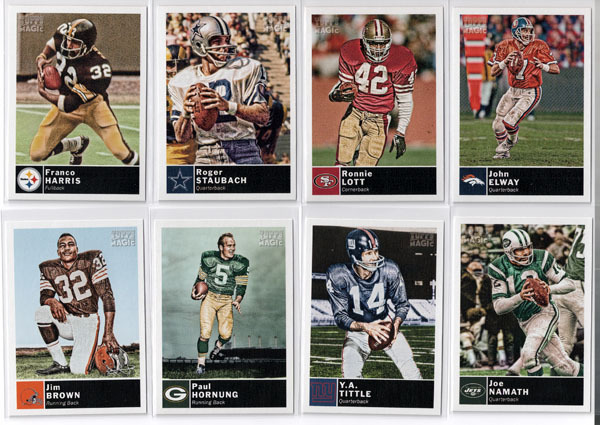 Tittle to Paul Hornung to Franco Harris to John Elway to Adrian Peterson to Sam Bradford, the checklist has something for collectors all ages. As I noted above, one of the best things about 2010 Topps Magic is that there is a great deal of value outside the 3 guaranteed autographs per box. The base set short prints, mini cards, black mini cards, pigsking mini cards (#'d to 50) and inserts are all extremely cool, collectible and worth something. The box price is also a bargain, carrying a price tag of around $90. 2010 Topps Magic is an insanely fun and imaginative product that reminds you of why you started collecting to begin with. There's something extremely fun about opening a product that offers collectors more than just hits. In my opinion, one of the most enjoyable things in collecting is breaking a box or two of product, then taking the next couple days to sift through what you got (short prints, etc). Sure, there are a few things that are mildly annoying such as the sticker drop autos, but as a whole, 2010 Topps Magic is both a great value, a great product and a great deal of fun to rip. 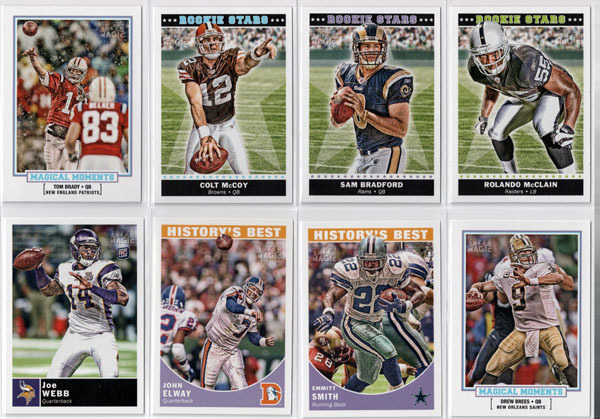 Magic is an excellent football card offering for those looking for a change of pace retro product in a year in which it seems like every product looks the same. The best part about Magic is that it makes for an intriguing set building experience, the even better part is that you don't have to be a set builder to reap the rewards of Magic's set builder friendly checklist. 2010 Topps Magic is one of the year's best and most refreshing products. If you've grown tired of opening products with 2-4 hits and a stack of meaningless base cards, I highly suggest you give Magic a try, it does an excellent job of making every card both meaningful and collectible. Each $90 hobby box of 2010 Topps Magic delivers 3 autographs and a stack of short prints, mini's and inserts. 2010 Topps Magic Football Hobby Box - Factory Sealed! I love this product….I agree with your views. But i don’t know if i should buy boxes of it because the auto’s it delivers r worthless. What are you going to do with a matt leinart auto un-numbered etc. etc. From any point of view I don’t understand why some third stringer is in a product let alone doing auto’s. 90 bucks seems too much for this product when u could end up with some bum auto’s. I love the design and the retro feel to it. It really is sweet but im skeptical on the long term value. @ryan: You’d be suprised, last year they short printed some pretty bad players such as Kenny Irons (20), Willie Parker (25), Larry Johnson (25), Kolby Smith (25), Selvin Young (25), Michael Clayton (25) and so on. The few Kenny Irons that saw there way onto eBay sold for well over $200, $300 and $400 in some cases. I suspect Topps did the same thing with the autos this year, so I would suggest looking every auto you get up on eBay to see how many of that card have been listed, if it comes up 0-5, chances are you have one of the shortest printed autos in the set. I am a Buffalo Bills collector. I realize that the Ed Wang, Paul Posluszny and Trent Edwards autographs are amongst the short printed autos in the set. But, can anyone confirm that a Fred Jackson autograph card exists? 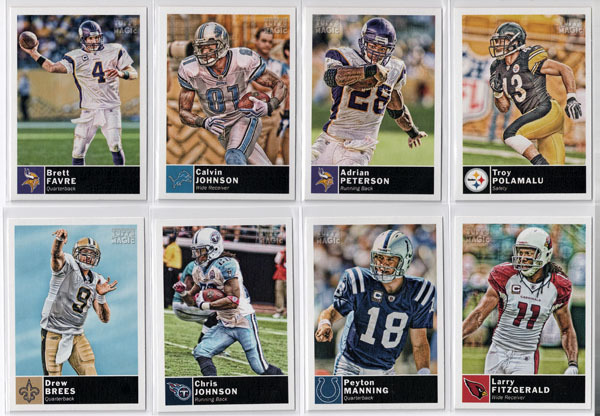 I have yet to be able to find one listed…if it isn’t a short print, it seems I would have seen one for sale on Ebay, by now….anyway, the Jackson card is #4 in the base set. @Dennis: it’s safe to assume there isn’t one, as though Topps stated early on that every player would represented in the auto set like last year, that didn’t end up being the case in the end.